The air-sea gas transfer of gases like CO2 is substantiallydetermined bythe properties of the aqueous diffusion sublayer and free-surface turbulent boundarylayer. 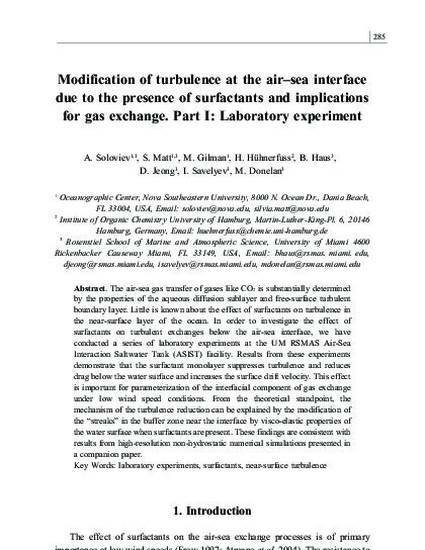 Little is known about the effect of surfactants on turbulence in the near-surface layer of the ocean. In order to investigate the effect of surfactants on turbulent exchanges below the air-sea interface, we have conducted a series of laboratoryexperiments at the UM RSMAS Air-Sea Interaction Saltwater Tank (ASIST) facility. Results from these experiments demonstrate that the surfactant monolayer suppresses turbulence and reduces drag below the water surface and increases the surface drift velocity. This effect is important for parameterization of the interfacial component of gas exchange under low wind speed conditions. From the theoretical standpoint, the mechanism of the turbulence reduction can be explained bythe modification of the “streaks” in the buffer zone near the interface byvisco-elastic properties of the water surface when surfactants are present. These findings are consistent with results from high-resolution non-hydrostatic numerical simulations presented in a companion paper. Website: The 6th International Symposium on Gas Transfer at Water Surfaces.